With a unique style that blends house, tech-house, techno, electro and progressive, Bernard is making a name for himself in the LA scene as a DJ that knows how to make you dance. Bernard is a veteran to the scene, with over eighteen years’ experience. 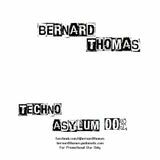 Bernard currently holds residencies with Frenzy afterhours in Hollywood and Normandie Events. He&apos;s been seen across the LA landscape and played alongside talent such as Chus and Ceballos, Donald Glaude, Justin Michael, Andy Caldwell and others at various venues including Avalon, Vanguard, Bardot, Playhouse, Circus, and countless others. In 2012 Bernard made his production debut on Elettrika Records with his first track called “Get That”, which was released on a “Best of Elettrika Records 2012” compilation and can be found on Beatport and iTunes. A master of sound and mechanics, Bernard brings it all together with an ear for the groove and a heart for the beat…Funky / Dirty / Tech, 3 words that come to mind!